Many of us own pickup trucks, but at the same time, many of us are unaware that we need to lubricate the front end of our pickup trucks to help maintain performance, and help prevent costly repairs. Below is a step-by-step guide to lubing up the front of your truck because greasing your truck is not a suggestion. 1. When you are lubing up your truck, you will want to have a jacks available to lift up the truck. Place a jacks underneath your truck frame on the front end on each side. When you can safely access the linkage of your truck, you will be alright to access the lubrication access points. You can also use a hydraulic jack for easier access and safety. Use a light to illuminate the darker areas that you may not be able to see. 2. On the inside of your front wheels, on both your passenger and driver sides, you will find the upper and lower control arms for your wheels. Locate the upper and lower ball joints that connected to the two triangular control arms. Next, find the zerk fittings, and wipe them off with a rag on these joints. You may need to use a tool, such as a flat-head screwdriver, to remove any caked on grease. 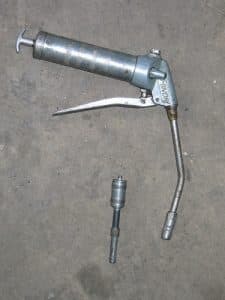 Next, you will want to use a grease gun, and apply it to the fitting. Give the gun several squeezes, and when the boot starts to leak grease, you have applied enough. 3. You will want to find the outer tie rod on the driver’s side, located in the same area attached to the medium-length rod with a knuckle on the end. Inject grease into that area, then go to the other end of the rod with the second knuckle, the inner tie rod, and inject grease into that one as well. 4. The next thing you will want to lubricate is the Pitman arm on the driver’s side. This arm resembles a club connecting to the linkage. You will notice a zerk fitting on this arm, and if you do not, turn the steering wheel to move the rod away from any obstructions. When you find the fitting, lubricate it. 5. On the passenger side there is a smaller idler arm, which resembles the Pitman arm, and lubricate it at the zerk fitting. Again, if you can not find the fitting, turn the steering wheel to reveal it. 6. Lubricate your drive shaft next by locating the zerk fittings. You may need to rotate the shaft to find the fittings by placing your truck in neutral and releasing the parking brake. This should reveal the fittings. Lubricate both of them, and you are done. Overall, there should be about 13 fittings to lubricate. Your truck is now properly lubricated and is ready to return to the road. ← Can I Install My Own Lift Kit?